In the long history of the Orthodox Church, a defined style of Church architecture has developed. This style is characterized by the attempt to reveal the fundamental experience of Orthodox Christianity: God is with us. The fact that Christ the Emmanuel (which translated means: God with us”) has come, determines the form of the Orthodox church building. Orthodox Church architecture reveals that God is with men, dwelling in them and living in them through Christ and the Holy Spirit. It does so by using the dome or the vaulted ceiling to crown the Church building, the house of the Church which is the people of God. In the dome is painted the icon of “Christ the Almighty.” The painted dome, or the spacious, all embracing ceiling, gives the impression that in the Kingdom of God, and in the Church, Christ “unites all things in Himself, things in heaven and things on earth,” (Ephesians 1:10) and that in Him we are all “Filled with all the fullness of God.” (Ephesians 3:19). The Dome iconography presents an icon of Christ the Almighty, the Pantocrator, being held up by six angels. The lower level of the dome features several Prophets of the Old Testament: Moses, Aaron, David, Solomon, Samuel, Isaiah, Elijah, Ezekiel, Jeremiah, Daniel, Malachias and Zacharias. It has been said that the Churches of Western Christianity with their Gothic design try to reach toward heaven, while the Byzantine structures of Eastern Christianity attempt to bring a little of Heaven down to earth. The design as well as the traditional adornment of the interior of our Church is based on this concept. The interior is divided into three main sections: The Narthex, the Nave or Church proper, and the Altar area. The Narthex serves as the area where the faithful prepare themselves to enter the main Church. Here the faithful light their devotional candles as a reflection that as Christ is the light of the world, so are they to reflect that light in their lives. Here they also venerate the icons as they prepare to enter the nave where the people of God gather to worship. Separating the Sanctuary, or Altar area, from the Nave, is the Iconostasion, or Icon Screen. Behind the Iconostasion is the Holy Altar Table. On the Altar Table are the Tabernacle in which the Reserved Sacrament of Holy Communion is kept, the Book of the Gospels, the blessing cross, and candlesticks. Directly behind the altar is a cross with an icon of Christ Crucified. To the left of the Altar is an Table of Preparation where the Holy Gifts of Bread and Wine are prepared for the celebration of the Divine Liturgy. There is a traditional order for the placement of the Icons on the Iconostasion. On the right side of the Beautiful Gate are the icons of Jesus Christ, St John the Baptist, the Archangel Gabriel and St Demetrios. On the left side; the Virgin Mary with Christ as a child, St Nicholas, the patron saint of our Church, the Archangel Michael and Sts Constantine and Helen. The icons of the Archangel are painted on the doors leading into the Sanctuary for it is they who guard the entrance into the Kingdom of Heaven. The area immediately in front of the icon screen is called the Solea where a majority of the sacraments and services are celebrated. There are usually found small tables for the sacraments. On the Solea we will also find the Pulpit, Bishop’s Throne and Chanter’s stand. Orthodox Church buildings often have icons painted on the wall. On the Apse, the area behind the Altar Table in the Sanctuary, is the icon of the Virgin Mary. Her arms are stretched out and the Christ Child is enthroned within her. This particular icon is called the “Platytera” which stands for a title of the Virgin Mary- “Platytera twn Ouranwn”- “More Wider than the Heavens.” It is she who gave birth to the Son and Word of God who is infinite and eternal, yet through His human birth entered time and history as a man. Depicted in the icon are also the Archangels Michael and Gabriel who approach the mystery of the incarnation with awe. Below the icon of the Platytera and over the Royal doors, is the Icon of the Communion of the Apostles. The Holy Eucharist is the sacrament par excellence of the Orthodox Church. It is our union with Christ as we partake of His Body and Blood. This particular iconographic representation is not an icon of the Last or Mystical Supper but one of Christ, the eternal High Priest, offering His Body and Blood to the whole world in persons of His disciples. On the right side, receiving from the Cup are the disciples John, James, Matthew, Thaddeus, Simon and Philip. On the left side receiving the Body are the disciples Peter, James Alphaeus, Andrew, Bartholomew, Judas Iscariot and Thomas. The disciples are in a posture of approaching the Sacred Mysteries with humility and reverence. Alone among the disciples, Judas Iscariot presents a haughty posture and he alone faces away from the Lord, rejecting a life in union with Christ. 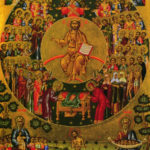 Below the icon of the Communion of the Apostles are six of the many bishops and shepherds of the Orthodox Church who were faithful imitators of the Great High Priest and Chief Shepherd of the Church, Jesus Christ. They hold in their hands scrolls on which are written the first lines of priestly prayers of the Divine Liturgy or Gospel passages. In the right transept of many churches are figures of male saints, such as Polycarp of Smyrna, Nicholas, Dionysios, Nektarios, Haralambos, and Gerasimos of Kefalonia. In the left transpet the female saints are pictured, such as Katherine, Irene, Theodora, Elizabeth, Photini, Barbara, Sophia and her children Faith, Hope, Love. Orthodox Church Tradition calls for the elaborate use of symbolism and iconography in the interior decoration of the Church Building. To they eye of a Western Christians, Byzantine iconography may appear austere and unemotional. Icons are not simply portraits representing people, but graphic presentations of spiritual truths. They remain unmoved, formal and with only a hint of emotion appearing in the face of the figures. Icons are not intended to evoke an emotional response as they do invoke understanding and wisdom. In the Orthodox Tradition, icons are symbols albeit powerful symbols, not idols. They are venerated and not worshiped. When an Orthodox Christian venerates an icon the honor is directed to Christ or the Saints depicted in the icon and not to the material itself. In the Orthodox Church the icons bear witness to the reality of God’s presence with us in the mystery of faith. The icons are not just human pictures or visual aids to contemplation and prayer. They are witnesses to the presence of the Kingdom of God to us, and our own presence in the Kingdom of God in the Church. The power of icons is not mechanical or magical, but spiritual. It is a working of God’s grace in the act of a personal expression of faith and through the intercessory prayers of the saints who live in God’s glory. Icons teach us about Christ and His ministry , as well as about the Saints and their record of faith. As sacred art, icons are “windows into Heaven.” They seek to symbolize the transfigured cosmos and the victory of redeemed creation by the glory of Christ. In the word of Saint John of Damascus: “The icon is a song of triumph, a revelation and an enduring witness to the victory of the Saints.